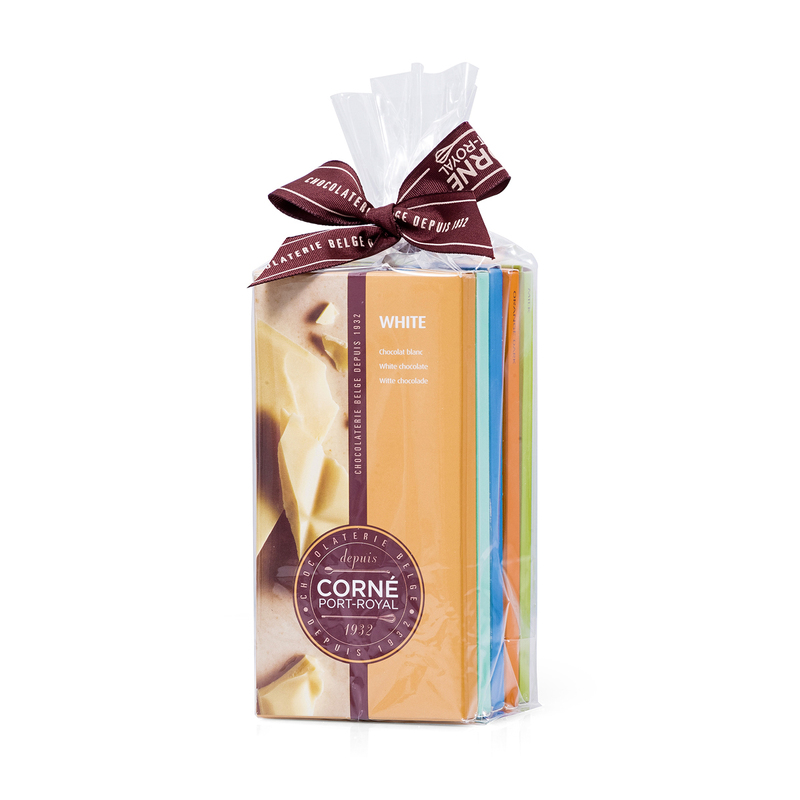 This scrumptious sampler offers five different flavors of Corné Port-Royal Belgian chocolate tablets. 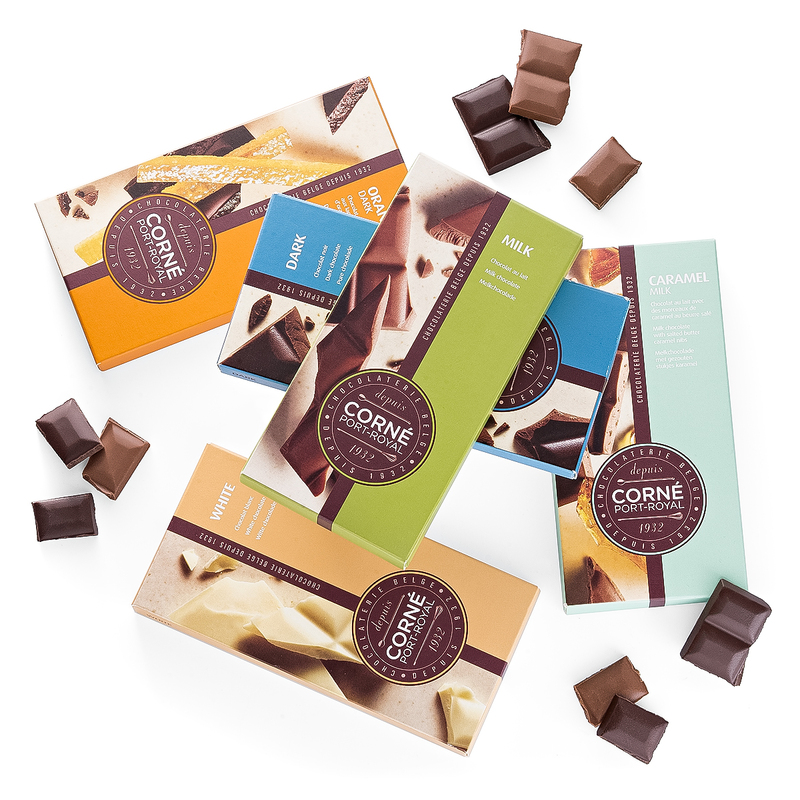 The generously sized tablets are a welcome treat for any chocolate lover - including yourself! 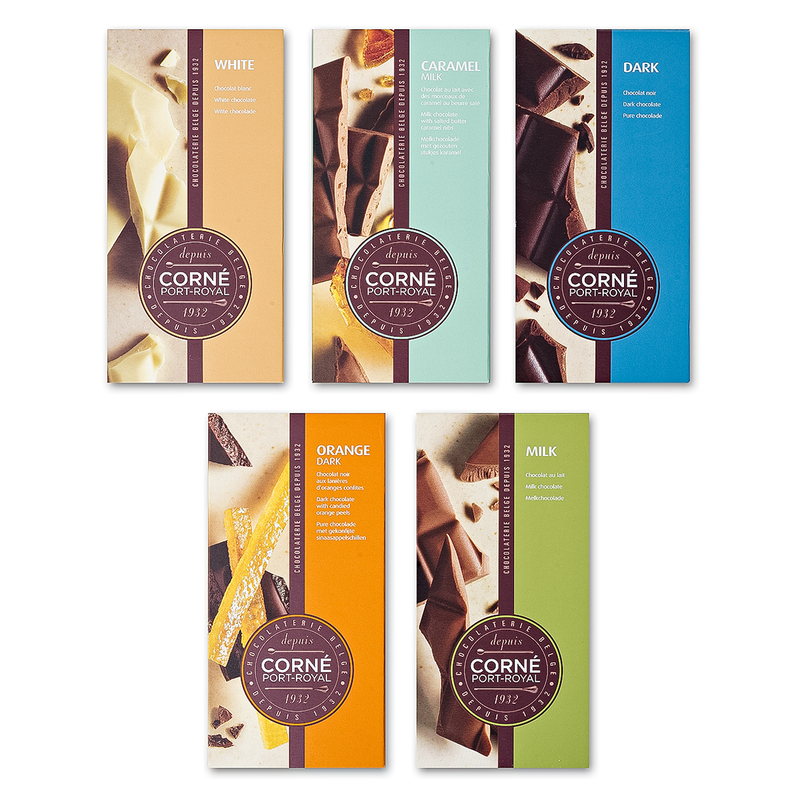 Discover all the delicious flavors: milk chocolate, dark chocolate, white chocolate, milk chocolate with caramel nibs, and dark chocolate with orange peels. The tablet sampler is the perfect pick-me-up for any occasion or just for fun. Milk chocolate contains: cocoa solids 28% min., milk solids 22% min. Allergy Advice: Contains: milk, soy. May contain traces of nuts, eggs, sesame and gluten. Ingredients: Sugar, whole milk powder, cocoa butter, cocoa mass, glucose syrup, cream, emulsifier: soya lecithin (E322), butter, flavour: vanillin, salt, emulsifier: E473. Allergy Advice: Contains milk and soya. May contain traces of eggs, gluten, sesame and nuts. Dark chocolate contains cocoa solids 52% min. Allergy Advice: Contains milk, soya. May contain traces of eggs, gluten, sesame & nuts. Dark chocolate contains: cocoa solids 52% min. Allergy Advice: Contains or may contain traces of milk, soy, nuts, gluten, sesame, eggs. White chocolate contains: milk solids 22% min.